Crumbles and crisps are among our favorite desserts, but especially in the fall. Filled with seasonal fruit and warming spices, they are such a comforting treat. They are simple to put together and a great way to use a lot of very ripe fruit at once. At this time of year, most people turn to apples for fruity desserts, but there are plenty of other fruit options. Right now Italian prune plums are in their peak season in our area. For me, the sign of a good crumble or crisp is a juicy, fruity mess hidden by a sturdy, crunchy topping. It’s important to always use very ripe fruit. You want all the fruit’s natural juices to bubble over. Adding nuts to the crumble mixture gives depth of flavor and texture for an extra hardy topping. In a large bowl, toss together the quartered plums and honey. Set aside. In a medium bowl, whisk together the flour, walnuts, maple syrup, cinnamon and cardamom. Gently pour in the coconut oil a little at a time, mixing with a fork or your fingers. You want to create small clusters. 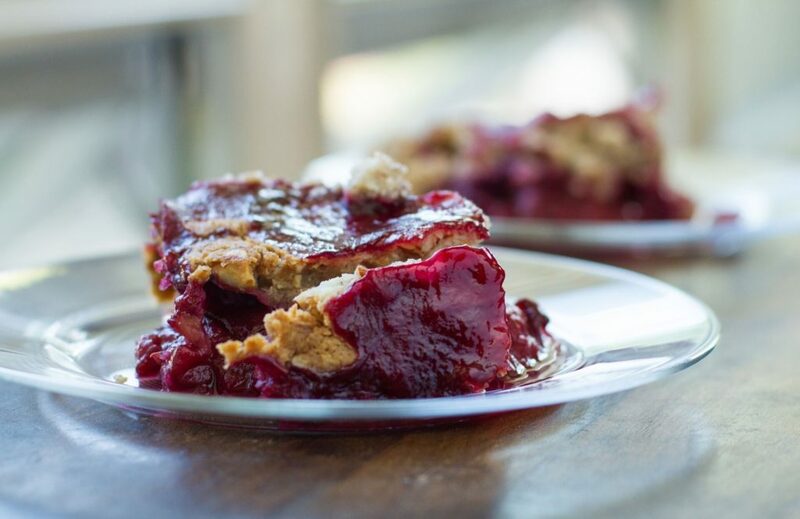 In a 4 x 4 baking dish, add the sweetened plums. Top with the crumble mixture. Bake in the oven for 45-50 minutes. The top should be browned and the plum juices bubbling. Once finished baking, remove it from the oven and let it cool for 5-10 minutes before serving.